I grew up in a household of dogs, who were part of our family. Then 38 years ago I started training and working dogs. I particularly love dogs that are intelligent, eager to please, and are easy to train. I am a firm believer that what one puts in, is what one gets out. 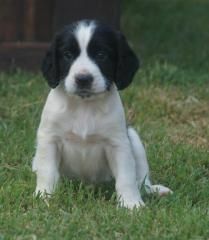 Springers are incredibly affectionate dogs, who really love to be part of an active family. 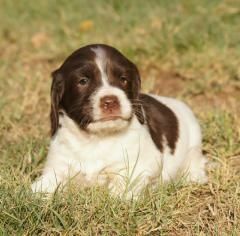 My Springers are themselves workings Gundogs as well as being family members. They are part of everyday of my life. Springers need human contact and I strongly recommend that they are indoor dogs as this truly builds a special bond between them and their human family. 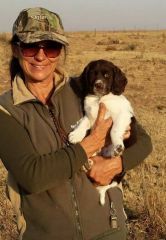 I believe all pups need training, whether it be basic puppy classes, to competitive obedience, agility, working trials, field trials or working gundogs. Training is imperative so that the pup understands what is expected of him and it makes a happy home environment. 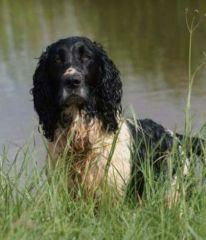 Springers love to play, retrieve, and swim. They are incredibly easy to train and an absolute pleasure to own. They are great with children and other dogs. But I still believe that it is of the utmost importance for parents to teach young children how to behave and treat puppies, and older dogs. All my pups are whelped in my home and only move into their puppy area, which includes a Wendy House with fans in summer and heaters in winter, they also have a large grass area to play, with loads of toys for added stimulation. They are raised on a high quality food. They get loads of love and TLC from myself. I am a dog trainer so I spend loads of time with all my own dogs and my puppies. I do assessments on all my pups between 6 and 7.5 weeks, to determine which dogs will be suitable as a working dog, or the best temperament to best suit the new family. I am based in Centurion, Gauteng. Transport can be arranged to all major local airports or Internationally, at the new owners costs. Wildspirit is a registered Affix. Sold with Breeding Restrictions and a Sales Agreement signed between myself and the new owner. All my pups are KUSA registered. They are vaccinated at 5 weeks and dewormed 3 times by the time they are 8 weeks old, they are also micro chipped. KUSA registration certificates will follow within 6 weeks after collection of pup. Pups are ready for adoption from 8 weeks of age.